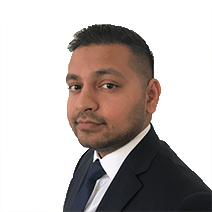 Naqibul qualified as a solicitor in 2016 and has been working for the firm since February 2019. Naqibul completed his LLB at the University of Westminster and the Legal Practice Course at the University of Law. Naqibul completed his training with a firm in London. He has specialised in residential conveyancing since qualifying and has experience dealing with various types of transactions such as sales, purchases, new build matters, shared ownership, remortgages, transfers of equity and lease extensions.